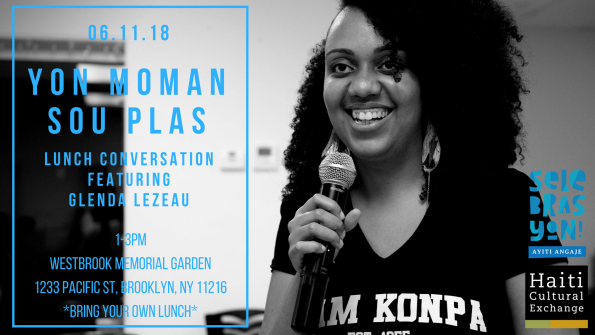 Join HCX and Lakou NOU 2017 Artist Resident, Glenda Lezeau as she host an Atis Angaje lunch conversation discussing the work that she did during her “Canarsie’s Konpa Celebration” residency project. She’ll be delving into what it means to create spaces for celebration during times highly political times. The program is an opportunity for participants to have a talk together over lunch in spirit of informal public convening naturally a part of Haitian culture. A contemporary photo exhbition by Haiti-based artists, curated by Maksaens Denis, will also be on view. DATE/TIME: Monday, June 11th | 1-3pm. Selebrasyon! is New York City’s only festival dedicated to the promotion of the highest caliber film, dance, music, literature, and visual art of Haiti and its Diaspora. Haiti Cultural Exchange’s 3rd Biennial celebration will bring artists and diverse communities together to experience Haitian culture, its creative foundations, and its powerful legacy. This year, HCX is pleased to announce that six Haiti-based artists will be participating in Selebrasyon! programming. This is all thanks to the support we have received for our HaitiXNY initiative, which aims to bring more artists from Haiti to present their work. Download the Selebrasyon! Event List. This entry was posted on Monday, May 14th, 2018 at 11:00 am	and is filed under An n' Pale, Archive, Public Forums, Selebrasyon!, Social Justice. You can follow any responses to this entry through the RSS 2.0 feed. You can leave a response, or trackback from your own site.